Hooray for the big multiplexes who offer screenings for mums, dads and carers of babies and toddlers. And at a much reduced ticket price too! BYO popcorn, don’t forget the kids and enjoy that movie. Relax and unwind, as we host the latest movies on the big screen, including comedy, drama, action and sci-fi flicks with all tickets just $11* and kids under five FREE! We’ll dim the lights and soften the volume, to ensure you can sit back and enjoy your break. Weekly sessions times are updated regularly, so check the website for upcoming movies. 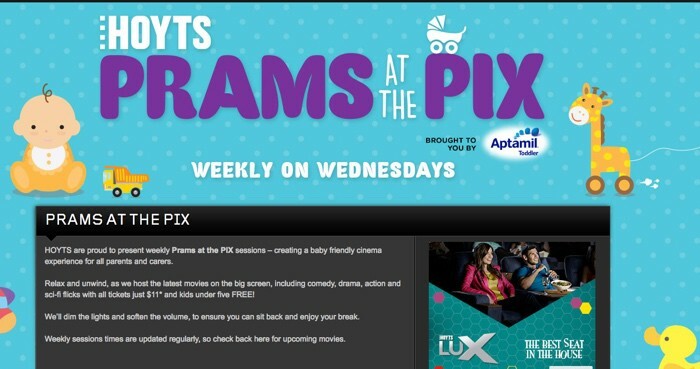 NB Prams at the PIX sessions are not held during school holiday periods. Sessions are subject to change without notice. Not available in the following locations; Chatswood Westfield, Melbourne Central and Chadstone. An online booking fee applies per ticket – $1.20 for General Admission. All the other viewers have kids too so no-one will mind the odd squawk from your child. Do you take your baby to the movies? Can you share any top tips for cinema success? Where is it on their website? I have not been able to find anything about this. When you go to their help page it doesn’t come up in a search either. Oh thanks for letting me know this info was out of date. I’ve revamped that post and it should explain all now with a direct link.